Vibration Research (VR) designs and manufactures vibration control systems for electrodynamic and servohydraulic shakers. Since 1995 Vibration Research has become a pioneer in the industry and a leader in the field of vibration control. Advanced hardware capabilities combined with powerful user friendly software make Vibration Research controllers the premier choice of testing labs around the globe The Model VR9500 the highest resolution in the industry with 26000 lines of Resolution, 100dB Dynamic Range and Control Sine, Random or Shock to 50,000 Hz output. Vibration Research also offers User Friendly Controller Software and uniquely Software packages for Fatigue Damage Spectrum for measurement of product lifespan and KURTOSION when your in-service vibration environment is not Gaussian. 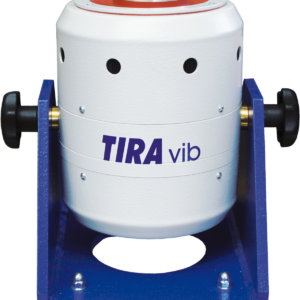 The Tira Vibration Shakers use permanent magnets and are available as portable and stationary systems for simulating ambient vibration conditions. Robust design ensures a long service life, and typical applications include structure analysis and testing smaller sub assemblies. These shakers are characterized by high lateral and axial stiffness and come in lightweight construction as specified by industrial users. New rare earth magnets have been added to the range of conventional Alnico magnets, reducing weight from 36 kg to 12 kg for easy handling particularly in mobile applications. Our shakers have proven their worth in environmental labs, universities and industrial production lines both for components and calibration. These complete systems enable testing in accordance with national and international standards such as DIN, ISO, BS, MIL, IEC and ASTM.